Editor’s note: You may have missed this article when CMI published it in 2015. We’re publishing this update because well-crafted personas are so essential to successful content marketing. Like all content marketers, you are probably crunched for time and always looking to trim unnecessary processes. 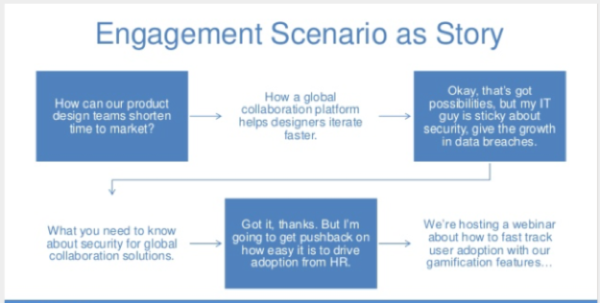 But you shouldn’t think of personas as one of those nice-to-have tools abandoned as soon as you build them. Having documented personas, even in their simplest forms, will not only help you crystallize your ideas, but also serve as a single version of truth for everybody creating content for your organization. If you are like the 68% of B2B and 73% of B2C marketers who are focused on building audiences as part of their content marketing strategies, stay tuned. I’m here to take the stress out of persona development – and help make them as practically useful as possible. Read on to learn the essential steps for creating and applying content marketing personas more successfully. 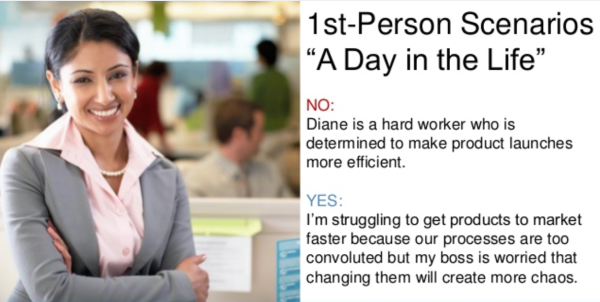 What are personas, and why do you need them? As defined by Ardath Albee, a persona is a composite sketch of a target market based on validated commonalities – not assumptions – that informs content strategy to drive productive buyer engagement (i.e., revenue). Without personas, you may only guess what content your audience wants, which means you are more likely to revert to creating content around what you know best (your products and company) instead of around the information your audience is actively seeking. Furthermore, you personally may have a handle on this information, but does everybody creating content in your organization have that same vision of your ideal audience? Documenting your personas, even if done quickly, is key to keeping everybody focused on the same audience. When you think of your audience, you may first think in business demographic terms. Naturally, you want your personas to include the most relevant data points (e.g., business type, job title and function, geographic location). However, while this data is used primarily to group audience members by what they have in common, personas enable marketers to hone key differentiators that, once revealed, could give your company’s content an edge. Even for time-crunched content marketers, anything that can help you to prioritize the most competitively relevant and strategically aligned insights should be considered invaluable. Step 1: Envision your ideal customer. This should be the person your content efforts are likely to help most. To build a picture of who she (or he) is, give the person a name and fill in the most critical characteristics relevant to your business. This character sketch will serve as the foundation of your persona. Who is she? What demographic characteristics describe her? What’s her job title and function? What kind of company/industry does she work in? How long has she been serving in this capacity within the organization? What experience/expertise does she bring to this role? How does her job relate to the job of others in her department, and other departments in her organization? Step 2: Consider the specific objectives, responsibilities, and obstacles she might encounter regularly in performing her role. What goals does she need to accomplish to be successful in her job? What challenges frustrate her most about her job? What needs gaps might she be looking to fill or what specific problems would she need to solve to alleviate some frustration? What might keep her from addressing those gaps/problems? Step 3: Characterize her role in relation to your business’s buying cycle. Another way day-in-the-life scenarios can be helpful is that they provide a clearer view of your persona’s relationships to other members of the “buying committee” – i.e., the people/teams within an organization who are involved in making purchasing decisions for the company. How influential is she in her company’s decision-making process? Where might pushback come? Who else might influence her decisions (internal and external)? Does she need others to sign off on her decisions? How far along is she in her consideration process? What questions is she likely to ask to satisfy her criteria for making a purchase? What obstacles might stand in her way as she looks to satisfy that criteria? What keywords is she likely to use to search for the answers she needs to push forward? Step 4: Fill in her personal communication preferences. How does she typically access content? Are there particular formats she gravitates toward? Does she prefer to access content online, via a mobile device, or through other channels/platforms? Does she get most of her information during work hours or at home? How much information might she want to receive, and how often? How often is she exposed to relevant content/information as she goes about her typical day? How often does she log on to social networks? Which ones? Has she shown a preference for weekly vs. daily newsletters or updates? Who/what influences her content consumption? Whose advice does she trust or seek most when engaging with content (e.g., industry analysts, vendors, thought leaders, friends, colleagues)? Are there internal or external events that might trigger variations in her content consumption pattern? The answers to questions like these can help you identify potential content ideas that are most likely to catch her attention or move her closer to making a purchase. Step 5: Map your insights to your strategic goals. After you’ve gathered all the information to build your persona, Ardath suggests pulling it together into an engagement scenario, which will help your content team develop content ideas and assets that align with your persona’s needs. To build a sample scenario, like the one she shares below, Ardath says to think of the blue boxes as questions, hesitations, doubts, or concerns that your persona might have. The white statements are answers that your content would provide. Remember, it’s critical to document your persona and share it with everybody on your team so they understand who they are trying to engage. Further, to help keep your ideal audience member top of mind all the time, consider printing the persona and placing it in a visible spot or uploading it to your company’s intranet or communication hub so anyone who needs it can easily access it. As I mentioned, persona development is a customized process, so there’s no one-size-fits-all way to build it. However, the following template – which follows the framework described above – can be used as a starting point. Fill in the sections that are most relevant to your business; and don’t forget to give your persona a name and add a photo of her, which will help you see her as a real person and not just an abstract marketing construct. Consulting with your sales team – When gathering audience insights, Ardath says interviewing your salespeople and mining your existing CRM data should be your first step. These team members are on the front lines of customer interactions, so chances are they have plenty of information they can share. It also helps you align your personas with the people the sales team is most interested in interacting with. Interviewing your support staff – As Kane Jamison points out, your customer support team also knows a great deal about the reasons why buyers (and prospects) contact your company. Having a quick conversation with this team can give you a different view of the real-life struggles prospects and current customers are encountering, which can spark new ideas for content that might address them. Check out Kane’s post for a list of questions you can ask to tap into your support team’s knowledge base. One-on-one customer interviews – Nothing beats the ability to get information directly from current customers because they are able to provide much more detail on their content needs and preferences than you can gather through profiling data, analytics, third-party conversations, or standardized forms. External research – While it’s important to consult your internal resources and directly engage with customers, the data gathered through these methods can often be subjective, situational, or colored by interview bias. To enhance and validate your findings, it helps to do a little digging into publicly available information sources – such as LinkedIn profiles, industry blogs, and social media profiles of industry influencers – that aren’t likely to be influenced by your business agenda. Performance testing – Comparative evaluation of your existing content using techniques like split testing or through a scientific method can provide quantitative proof that the initial assumptions used to build your personas are on the right track. Progressive profiling – This technique uses automation tools, smart lead forms, and directed questioning to gather audience insights that grow more detailed over time, which can be used to confirm the accuracy of your characterization and deepen your understanding of her content needs. Analysis of current content consumption patterns – Analytics data such as page views, time on site, downloads, newsletter open rates, and bounce rates can also reveal important insights on where your audience’s top needs and interests may lie. Sentiment analysis – Social listening tools are getting better at assessing consumers’ emotional states to contextualize social chatter in a way that’s relevant to your business. Personas need to be updated: Once you have built your core personas, you’ll likely be referring to them often – for years to come. The problem with this, though, is that you may rely on the information long after it’s lost its relevance. For this reason, you should revisit your personas on a regular basis and update them as needed to make sure they remain in alignment with your current business goals and content marketing strategy, as well as reflect any opportunities that have emerged. Personas should be shared with other departments: While developing personas is primarily a marketing exercise, make sure to document and share this information with other teams in your organization. In particular, it is worthwhile to share your personas with your sales team, as well as with any new hires in your company – personas can help them become acquainted with your customers and prospects on a deeper level. And remember, in the age of social media, anyone in your organization could be engaging with potential prospects and customers, so it’s useful for everyone in your organization to be working from the same information. TIP: Consider creating two versions of the same persona – a detailed version for content creators and marketers, and a shorter version for the rest of the organization. Content marketing works best when you understand – and write specifically for – members of your audience. Meticulously crafted buyer personas can help you identify their interests and motivations, communicate with them on their own terms, and keep them top of mind throughout every step of your content marketing process. Do you have additional tips for developing and working with buyer personas? We would love for you to share them in the comments. 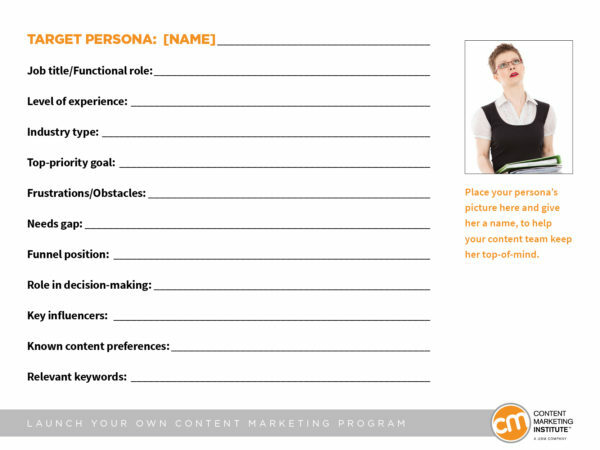 Personas are a great way to stay on top of a successful content marketing strategy. Another way? Subscribe to CMI’s daily or weekly newsletter. 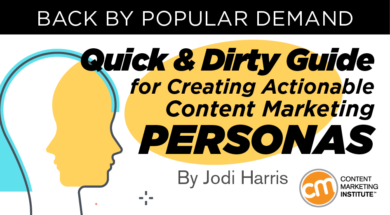 Editor’s note: This post has been updated because well-crafted personas are so essential to successful content marketing.